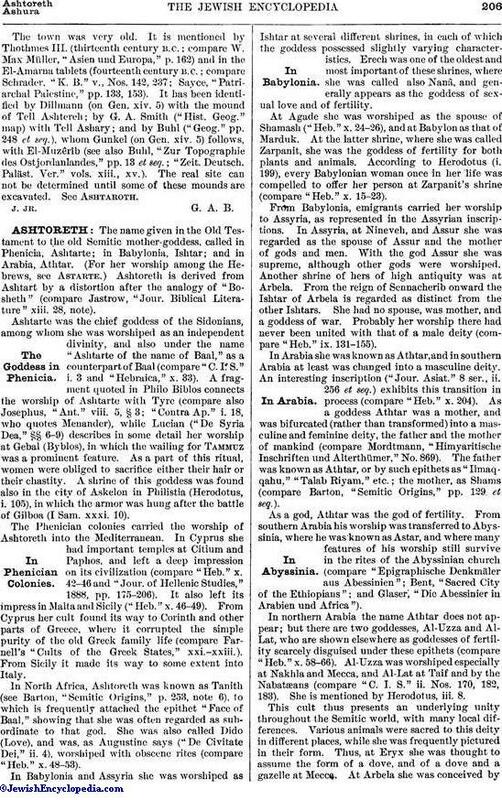 The name given in the Old Testament to the old Semitic mother-goddess, called in Phenicia, Ashtarte; in Babylonia, Ishtar; and in Arabia, Athtar. (For her worship among the Hebrews, see Astarte.) Ashtoreth is derived from Ashtart by a distortion after the analogy of "Bosheth" (compare Jastrow, "Jour. Biblical Literature" xiii. 28, note). Ashtarte was the chief goddess of the Sidonians, among whom she was worshiped as an independent divinity, and also under the name "Ashtarte of the name of Baal," as a counterpart of Baal (compare "C. I. S." i. 3 and "Hebraica," x. 33). A fragment quoted in Philo Biblos connects the worship of Ashtarte with Tyre (compare also Josephus, "Ant." viii. 5, § 3; "Contra Ap." i. 18, who quotes Menander), while Lucian ("De Syria Dea," §§ 6-9) describes in some detail her worship at Gebal (Byblos), in which the wailing for Tammuz was a prominent feature. As a part of this ritual, women were obliged to sacrifice either their hair or their chastity. A shrine of this goddess was found also in the city of Askelon in Philistia (Herodotus, i. 105), in which the armor was hung after the battle of Gilboa (I Sam. xxxi. 10). The Phenician colonies carried the worship of Ashtoreth into the Mediterranean. In Cyprus she had important temples at Citium and Paphos, and left a deep impression on its civilization (compare "Heb." x. 42-46 and "Jour. of Hellenic Studies," 1888, pp. 175-206). It also left its impress in Malta and Sicily ("Heb." x. 46-49). From Cyprus her cult found its way to Corinth and other parts of Greece, where it corrupted the simple purity of the old Greek family life (compare Farnell's "Cults of the Greek States," xxi.-xxiii.). From Sicily it made its way to some extent into Italy. In North Africa, Ashtoreth was known as Tanith (see Barton, "Semitic Origins," p. 253, note 6), to which is frequently attached the epithet "Face of Baal," showing that she was often regarded as sub-ordinate to that god. She was also called Dido (Love), and was, as Augustine says ("De Civitate Dei," ii. 4), worshiped with obscene rites (compare "Heb." x. 48-53). In Babylonia and Assyria she was worshiped as Ishtar at several different shrines, in each of which the goddess possessed slightly varying characteristics. Erech was one of the oldest and most important of these shrines, where she was called also Nanâ, and generally appears as the goddess of sexual love and of fertility. At Agade she was worshiped as the spouse of Shamash ("Heb." x. 24-26), and at Babylon as that of Marduk. At the latter shrine, where she was called Zarpanit, she was the goddess of fertility for both plants and animals. According to Herodotus (i. 199), every Babylonian woman once in her life was compelled to offer her person at Zarpanit's shrine (compare "Heb." x. 15-23). From Babylonia, emigrants carried her worship to Assyria, as represented in the Assyrian inscriptions. In Assyria, at Nineveh, and Assur she was regarded as the spouse of Assur and the mother of gods and men. With the god Assur she was supreme, although other gods were worshiped. Another shrine of hers of high antiquity was at Arbela. From the reign of Sennacherib onward the Ishtar of Arbela is regarded as distinct from the other Ishtars. She had no spouse, was mother, and a goddess of war. Probably her worship there had never been united with that of a male deity (compare "Heb." ix. 131-155). In Arabia she was known as Athtar, and in southern Arabia at least was changed into a masculine deity. An interesting inscription ("Jour. Asiat." 8 ser., ii. 256 et seq.) exhibits this transition in process (compare "Heb." x. 204). As a goddess Athtar was a mother, and was bifurcated (rather than transformed) into a masculine and feminine deity, the father and the mother of mankind (compare Mordtmann, "Himyaritische Inschriften und Alterthümer," No. 869). The father was known as Athtar, or by such epithets as "Ilmaqqahu," "Talab Riyam," etc. 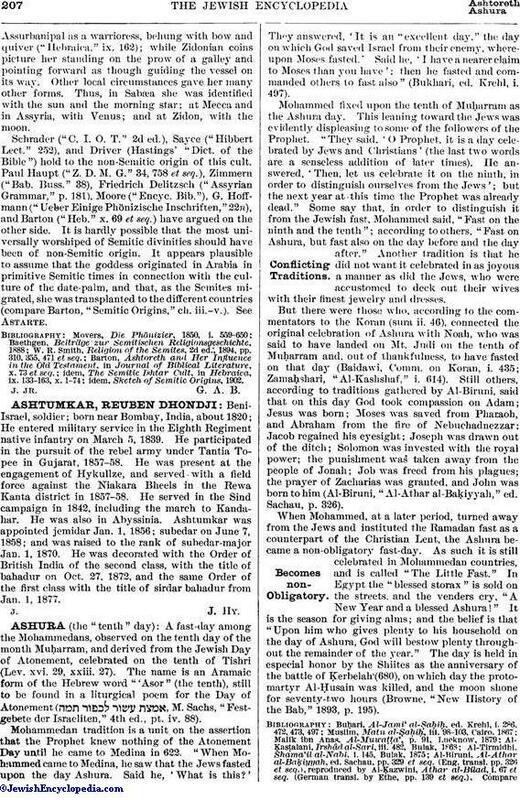 ; the mother, as Shams (compare Barton, "Semitic Origins," pp. 129 et seq.). As a god, Athtar was the god of fertility. From southern Arabia his worship was transferred to Abyssinia, where he was known as Astar, and where many features of his worship still survive in the rites of the Abyssinian church (compare "Epigraphische Denkmäler aus Abessinien"; Bent, "Sacred City of the Ethiopians"; and Glaser, "Die Abessinier in Arabien und Africa"). In northern Arabia the name Athtar does not appear; but there are two goddesses, Al-Uzza and Al-Lat, who are shown elsewhere as goddesses of fertility scarcely disguised under these epithets (compare "Heb." x. 58-66). Al-Uzza was worshiped especially at Nakhla and Mecca, and Al-Lat at Taif and by the Nabatæans (compare "C. I. S." ii. Nos. 170, 182, 183). She is mentioned by Herodotus, iii. 8. This cult thus presents an underlying unity throughout the Semitic world, with many local differences. Various animals were sacred to this deity in different places, while she was frequently pictured in their form. Thus, at Eryx she was thought to assume the form of a dove, and of a dove and a gazelle at Mecca. At Arbela she was conceived byAssurbanipal as a warrioress, behung with bow and quiver ("Hebraica," ix. 162); while Zidonian coins picture her standing on the prow of a galley and pointing forward as though guiding the vessel on its way. Other local circumstances gave her many other forms. Thus, in Sabæa she was identified with the sun and the morning star; at Mecca and in Assyria, with Venus; and at Zidon, with the moon. Schrader ("C. I. O. T." 2d ed. ), Sayce ("Hibbert Lect." 252), and Driver (Hastings' "Dict. of the Bible") hold to the non-Semitic origin of this cult. Paul Haupt ("Z. D. M. G." 34, 758 et seq. ), Zimmern ("Bab. Buss." 38), Friedrich Delitzsch ("Assyrian Grammar," p. 181), Moore ("Encyc. Bib. "), G. Hoffmann ("Ueber Einige Phönizische Inschriften," 22n), and Barton ("Heb." x. 69 et seq.) have argued on the other side. It is hardly possible that the most universally worshiped of Semitic divinities should have been of non-Semitic origin. It appears plausible to assume that the goddess originated in Arabia in primitive Semitic times in connection with the culture of the date-palm, and that, as the Semites migrated, she was transplanted to the different countries (compare Barton, "Semitic Origins," ch. iii.-v.). See Astarte. idem, Sketch of Semitic Origins, 1902.